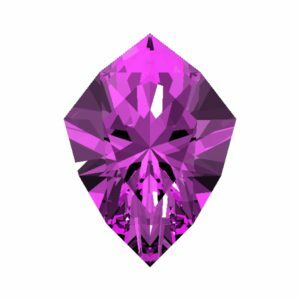 Stephan’s Shield faceting design, using a CAM-type preform. 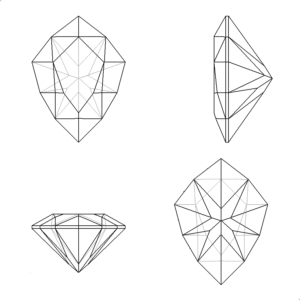 This is a simple, intermediate-level faceting design. If you’re already comfortable cutting CAM designs and one-fold symmetry, this one should be a snap. The only issue is that the initial pavilion facets don’t automatically come to a temporary culet point in the center axis of the stone. To deal with that, we will just use a pair of temporary guide facets to mark that center point, and cut the CAM facets to it. The lowest-angle CAM facets on the diagram are at 42.10°, on indexes 38 and 58. We’ll cut them first, along with two temporary facets AT THE SAME MAST HEIGHT AND ANGLE on indexes 16 and 80. Do this precisely, because you’re marking the center axis of the gem and any imprecision will make trouble later. These facets on indexes 16 and 80 will be cut-away later when we put in the real pavilion facets on those indexes at 48.10°. Be careful doing it because we need to precisely meet the point we’re cutting-away. If you cut this stone once or twice in GemCAD you’ll see how this works – and why – and it’ll be simple to do on the real stone. I’m interested in how much you enjoy Stephan’s Shield design and the video about it. Please leave your comments below – I’ll try to answer every comment or question.